Our Adult Brahms top has short sleeves and a modest scoop neckline. The neckline comes up to the neck bone in the back. There is a back zipper for ease of wear. This princess seamed top is made in Satin. 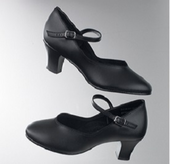 The piping on the waist and the removable bow are always made in black satin. The color options above will change the color of the top itself only. For example, if you choose the color "Claret", the top will be made in Claret and it will still have the black piping and bow at the waist. Please order by your bust measurement. This garment is Dry Clean Only.